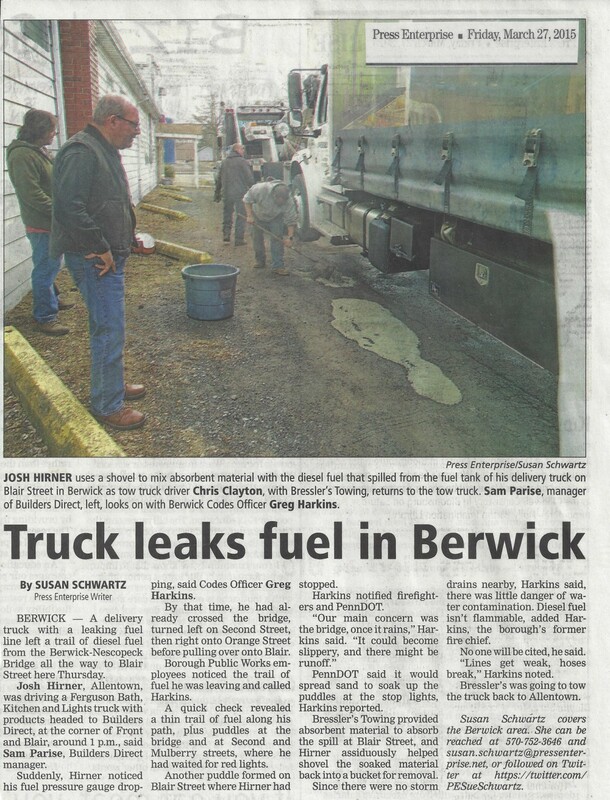 BERWICK — A delivery truck with a leaking fuel line left a trail of diesel fuel from the Berwick-Nescopeck Bridge all the way to Blair Street here Thursday. Josh Hirner, Allentown, was driving a Ferguson Bath, Kitchen and Lights truck with products headed to Builders Direct, at the corner of Front and Blair, around 1 p.m., said Sam Parise, Builders Direct manager. Suddenly, Hirner noticed his fuel pressure gauge dropping, said Codes Officer Greg Harkins. By that time, he had already crossed the bridge, turned left on Second Street, then right onto Orange Street before pulling over onto Blair. Borough Public Works employees noticed the trail of fuel he was leaving and called Harkins. A quick check revealed a thin trail of fuel along his path, Plus puddles at the bridge and at Second and Mulberry streets, where he had waited for red lights. Another puddle formed on Blair Street where Hirner had stopped. Harkins notified firefighters and PennDOT. PennDOT said it would spread sand to soak up the puddles at the stop lights Harkins reported. Bressler’s Towing provided absorbent material to absorb the spill at Blair Street, and Hirner assiduously helped shovel the soaked material back into a bucket for removal. Since there were no storm drains nearby, Harkins said, there was little danger of water contamination. 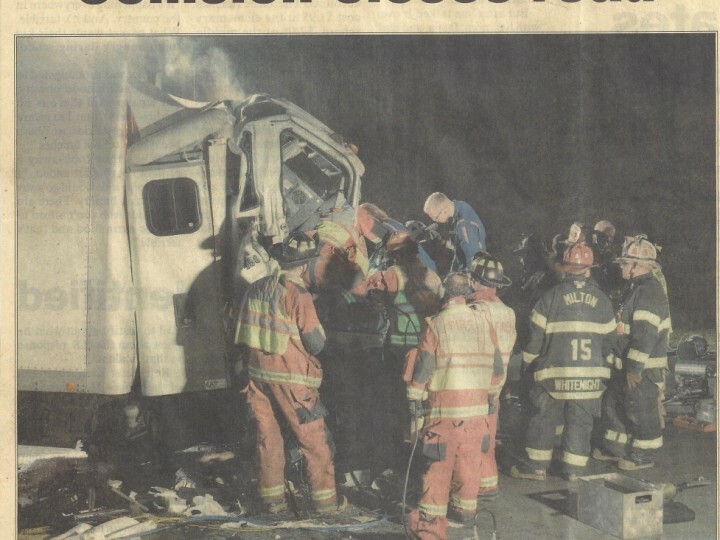 Diesel fuel isn’t flammable, added Harkins, the borough’s former fire chief. 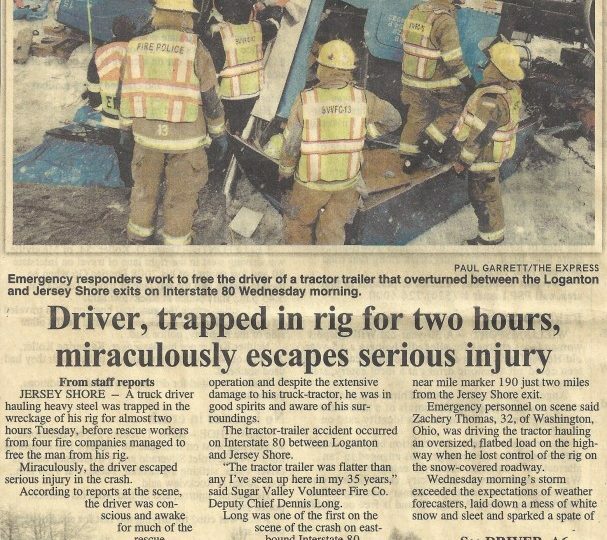 No one will be cited, he said. “Lines get weak, hoses break,” Harkins noted. 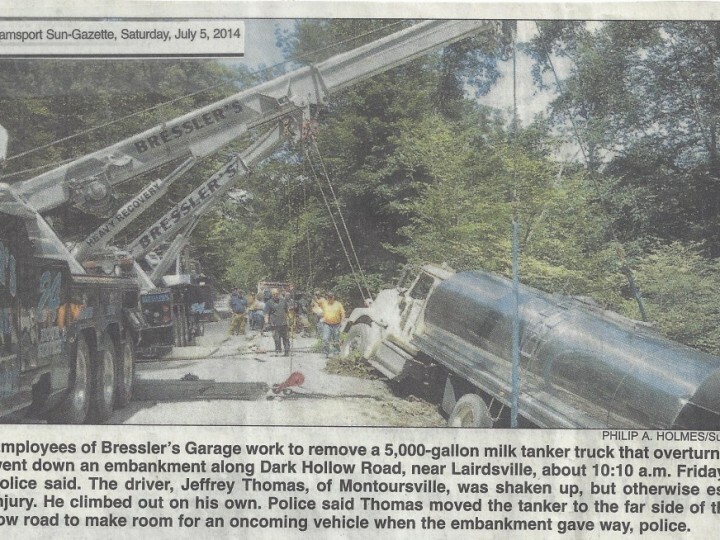 Bressler’s was going to tow the truck back to Allentown.